In this article, we explain how many types of data recovery exist and how Data Recovery Lab can deal with them successfully and recover your lost data. You will learn about different types of hard drive failure and how hard drive recovery can be successfully done by a skilled hard drive recovery technician. We will demonstrate how a disk behaves when it fails and help you identify different symptoms hard disk malfunction and what you need to do to get your data back. In this case, the hard drive is working fine and there is no apparent sign of failure but the data or the disk partition (data container) is inaccessible. Data or the disk partition becomes inaccessible when the drive has been accidentally formatted, or the file table has become corrupted. This is also applicable if a manufacturers “System Recovery” disk has been used. (This is the most common mistake people make thinking that by using the manufacturer’s misleadingly called “system recovery disk”, they will be able to “recover” their files while in fact by doing so they delete their files and overwrite the disk partition containing the data.) BIG NOTE: When you lose data, just switch off the computer and do nothing! You can do more harm by attempting DIY hard drive recovery using downloaded software from the internet or using “System Recovery Disk”. Just turn off the PC and contact a data recovery lab who specialise in recovering data from your computer. If you continue to use the machine, then there is a very good possibility that the lost data sectors will be overwritten by temporary internet files and your data will be lost for ever. Sometimes hard drives develop bad sectors either because of a bad read/write head or a bad surface, making it difficult or impossible to access via any Windows-based operating system. This can be most commonly diagnosed by the fact that the hard drive is seen correctly in the BIOS reporting the correct model number and capacity but the computer freezes when you try to access the drive. In this case, a sector-by-sector imaging or cloning of the entire drive must be done using a good and healthy drive. When the sector by sector imaging of the disk is completed, data recovery specialists will be able to use the healthy image to recover the data successfully. A hard disk whose PCB (Printed Circuit Board) or logic board has failed or died, falls under the category of electronic failure. This can be most commonly seen in a dead drive or a hard disk with a burning smell or sometimes a disk with a clicking noise. There is a wrong assumption that if you find a perfectly identical PCB and swap it with the faulty one, the dead disk will start working and the data will become accessible. This is wrong!All drives have a ROM (Read Only Memory (mainly WD & Seagate) or NVRAM (IBM/Hitachi) which contains information programmed into it and soldered onto the PCB. This information has to be exported to a file and then imported and re-programmed into the donor PCB. This requires specialist hardware and software costing a few thousands of pounds which can only be done by a well-established Data Recovery Lab who has invested in the equipment and employs highly trained data recovery technicians having plenty of expertise in the field. 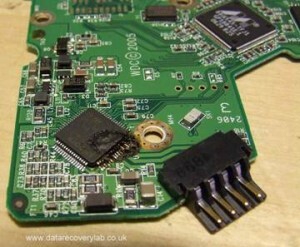 In some cases, such as Toshiba laptop drives, this ROM data is unique to the drive and so the original PCB must be repaired to facilitate a successful data recovery. In the majority of cases, electronic failure does also cause corruption or media problems such as bad sectors. As a result, the electronically repaired hard disk must be imaged or cloned immediately so that the actual logical data recovery performed thereafter. Firmware failure happens when micro codes or what is otherwise known as “firmware” stored in the Service Area (SA) on the platters of the hard drive, have been damaged or corrupted. Before the hard disk can start up and become ready for read/write operation, it needs to access the SA and read the information saved there. Repair of the corrupted information stored in the SA requires expensive hardware and software plus years of experience and technical knowledge to repair of the Service Area using replacement modules from compatible library drives. One small error can render your drive irrecoverable and completely inaccessible. Firmware failure can also cause partial media problems such as bad sectors; therefore in order to achieve a successful data recovery, immediate imaging is essential after firmware repair has been carried out. Physical failure can be defined as read/write head failure, head seizure or motor misalignment in a hard drive. In this case, a physical fault is preventing the drive to start up. This can range from a single failed head, to complete head stack or motor failure. 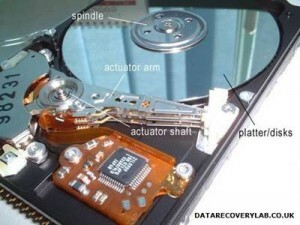 If you have a clicking hard disk, it may mean that the entire head stack in your hard drive has failed. If your drive clicks, DO NOT under any circumstances try to access it, or power it on. Especially if you freeze the hard drive (according to some misguided old wives tales spread over the internet), you WILL almost certainly destroy your data for good). Motor failure in a hard drive means that the drive is not spinning up at all or makes a quiet buzzing sound. In most cases, a motor failure requires the heads and platters to be removed and placed into a wood working chassis using special tools. All physically faulty hard disks need to be dismantled in a dust-free environment and the faulty heads removed and replaced by a skilled data recovery technician. This operation needs a lot of skill and an untrained IT person cannot do this under any circumstances. This is like a GP doing heart surgery on his patient in his own surgery on the examination bed! Sometimes due to compatibility issues, hard disk replacement heads can be difficult to source. Fortunately, Data Recovery Lab has built up a vast library of hard disks since 2001 and if cannot find a donor disk in its library, it can easily source it through its well-supplied partners. 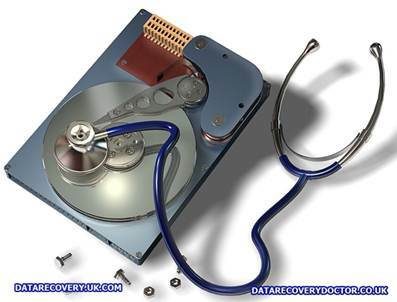 If you experience any of the above symptoms or need hard drive recovery, contact Data Recovery Lab technicians by calling 0207 516 1077. Hard drive recovery consultation is free and for those business or private customers in London or elsewhere in the UK mainland, we can arrange a free collection in order to provide a FREE data recovery diagnosis and a free quote. ©Copyright 2012. All rights reserved for Data Recovery Lab.